This paid membership grants you direct access to Dr. Sarah Ballantyne via a secret Facebook Group plus access to exclusive content, invitations to beta test new online courses and programs, and the opportunity to provide feedback and guidance on ongoing projects. Now that Dr. Sarah Ballantyne’s audience is in the millions, it’s logistically impossible for her to respond to individual e-mails, questions on social media, or comments on blog posts, despite the fact that both her audience and Dr. Sarah would love it if she could! 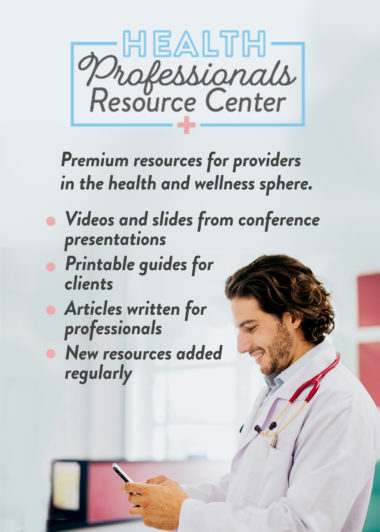 So, to meet demand, Dr. Sarah created this paid membership so you get insider access not just to Dr. Sarah herself but to lots of awesome content. Membership to the Insider Connection is capped so that Dr. Sarah really can have meaningful connection with its members. Insiders gain direct access to Dr. Sarah via a secret and private Facebook Group with a limited number of available spots. This paid membership also grants you insider access to exclusive content; allows you to contribute your opinion to future projects, blog posts, and podcast topics; and allows you to ask Dr. Sarah questions directly and get them answered! 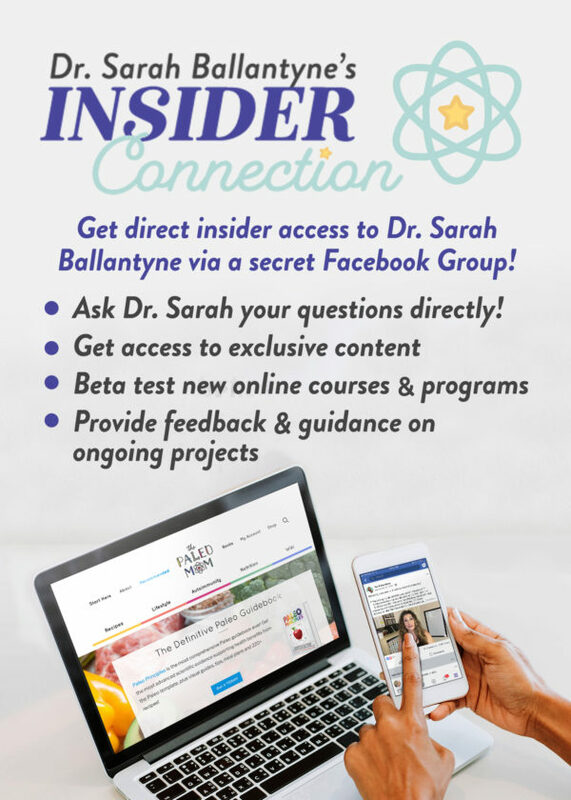 Within 3 to 4 days of signing up, you will receive an invite to a secret, private Facebook Group, called Dr. Sarah Ballantyne’s Insider Connection. Your invite will both be in your Facebook notifications and in the inbox of the e-mail address you provided at checkout under “Facebook E-mail”. Please ensure that you include the e-mail address that your Facebook account is connected to during check-out. This is the e-mail address that you use to log into Facebook. You can double check which email it is by clicking on the down arrow (triangle) icon in the top right corner of your Facebook account, selecting Settings, and then General. The e-mail address listed under Contact (primary) is the one to enter at check-out. Most of the Insider Connection awesomeness happens inside this Facebook Group, however membership also grants you access to exclusive and premium resources here at thepaleomom.com. In addition to answering your questions, the Insiders Connection is Dr. Sarah’s opportunity to provide you with personalized support and guidance to help you reach your goals. Dr. Sarah shares exclusive content (video, articles, sneak peeks, works-in-progress, research notes, etc.) within the secret Facebook Group as well as generating discussions based on the content shared. Dr. Sarah will also do scheduled Facebook LIVE Q&A videos and webinars (these will be announced ahead of time so you can plan accordingly) regularly. This behind-the-scenes access to Dr. Sarah’s works-in-progress, research notes, and first drafts is unprecedented. Within the secret Facebook Group, Dr. Sarah does her best to answer your questions in a timely fashion. However, Dr. Sarah can NOT provide coaching, individual consulting, or answer questions that should be directed to your healthcare provider. As an Insider, you will also be invited to beta test new online courses and programs, provide feedback on in-development content and e-books, get early access to recipes to kitchen test, and answer surveys to help guide Dr. Sarah’s future projects. Basically, this connection goes both ways. You get access to Dr. Sarah to answer your questions and provide guidance and support, while Dr. Sarah gets to use your feedback to refine and guide projects. This is a subscription. If you choose the monthly option, you will be billed monthly and will receive e-mail notifications. If you choose the annual option, you will be billed annually and will receive e-mail notifications. You may cancel your membership at any time; which gives up your spot in the Insider Connection to someone on the wait list. If the Insider Connection displays as out of stock, that means that the group has reached its cap. Enter your information below and Dr. Sarah will e-mail you when a spot becomes available. Make sure to enter your best e-mail address. When a spot does open up, you’ll only get 3 days from the time you’re e-mailed regarding an opening to join. $49.99 / month Buy It Now! $19.99 / month Buy It Now!